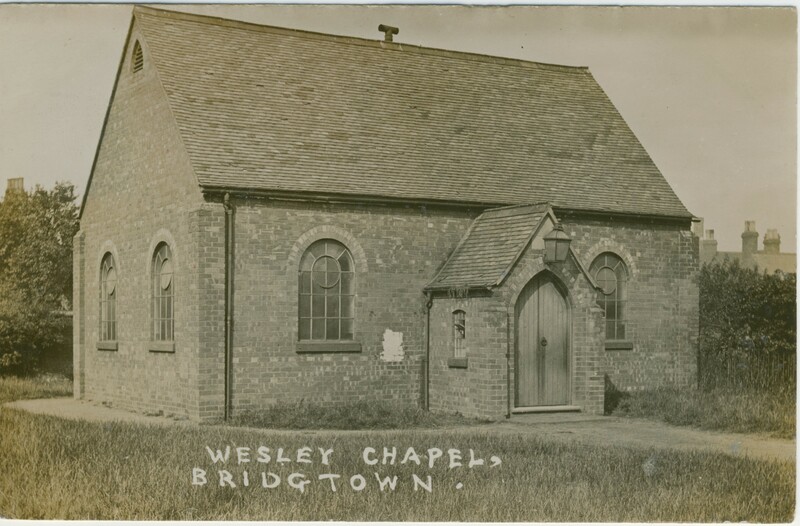 Englesea Brook Museum of Primitive Methodism postcard and picture collection contains this photograph labelled “Wesley chapel, Bridgtown”. We were confused as to which chapel this was. Bridgtown, usually spelled Bridgetown, is in Staffordshire and Staffordshire records refer to a Primitive Methodist chapel in East Street and a New Connexion (later United Methodist) chapel in Park Street. Google Street View shows no sign of the existence of either of these that I can find now, although they are both visible on the 1918 1:2,500 Ordnance Survey map. The map also shows a Wesleyan Methodist chapel in Union Street which is visible on Google Street View in 2009 but it doesn’t look like the building in the picture.